I have been involved in transforming organisations of over 20 years. Starting in creative engineering, spent formative years with Hilton International and in manufacturing. 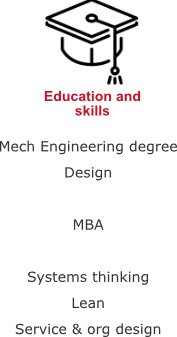 After obtaining an MBA, then worked in ABB, where the complexity of the reality of efficient and effective rapid operations became all too clear. I become exposed to national and international management and change projects. With Vanguard Consulting, the methodologies of systems thinking, lean and service design were learned. Especially being able to understand an organisation, together with its people and behaviours. Working with a multitude of different organisations, and very good consultants, gave me the experience and confidence to assess develop flexible approaches to the challenges that real organisations face. 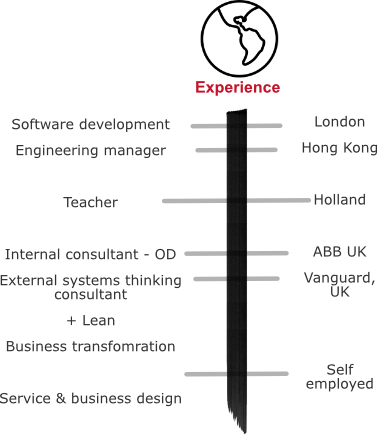 Now I see the opportunities of Design Thinking, Service Design and Organisational Design are increasingly incorporating various elements of business and operational competencies. My natural style is collaborative and I think in patterns. And I love the work I do. Put the customer experience at the heart of your business. Transforming the way that authority dealt with their needy citizens. The outcome developed into a community and locality based approach. The section manager fully embracing the systems thinking approach. Neighbour disputes, noise, anti-social behaviour - they all cause problems in communities. This council realised that it is better to help people rather than rebuke them. integrating local council, Police and mental health. Decreasing customer retention rates and increasing staff turnover. The transformation of a national Telecomms 1,400 strong contact centre - reducing waste and improving the customer experience. From policing restaurants and ticking boxes, to helping restaurants improve their food standards. A complete reversal of behaviour and results. Working with a large Police force, this example is of a small project to help managers understand now to view their handling of crimes according to what matters to the public.